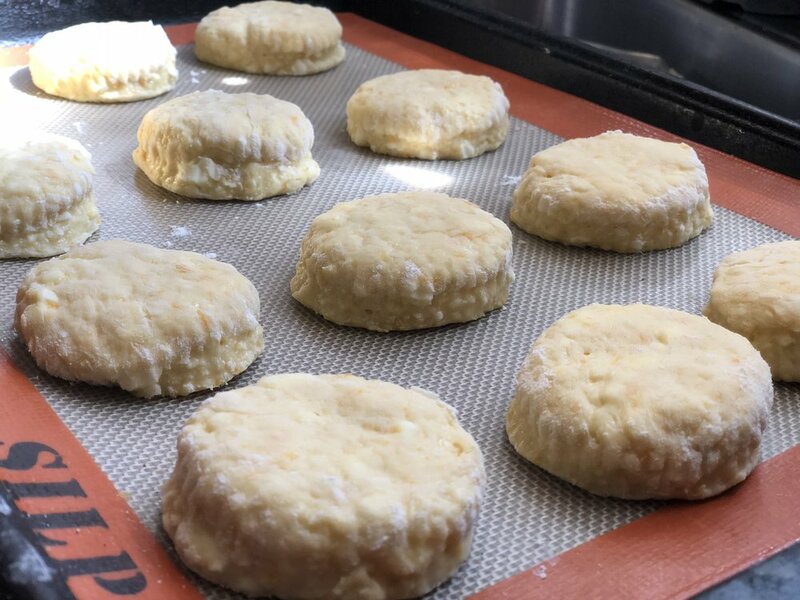 So it seems I woke up this fine Sunday morning, after having a great night out with friends… craving scones… which looking back on my other scone recipes seems to be a recurring thing. Out with friends having a great time the night before equals new scone recipe the next morning! You're welcome. Having not planned a Sunday morning scone bake-off, I used what was available to me in my kitchen.. which how all good recipes start off, right? 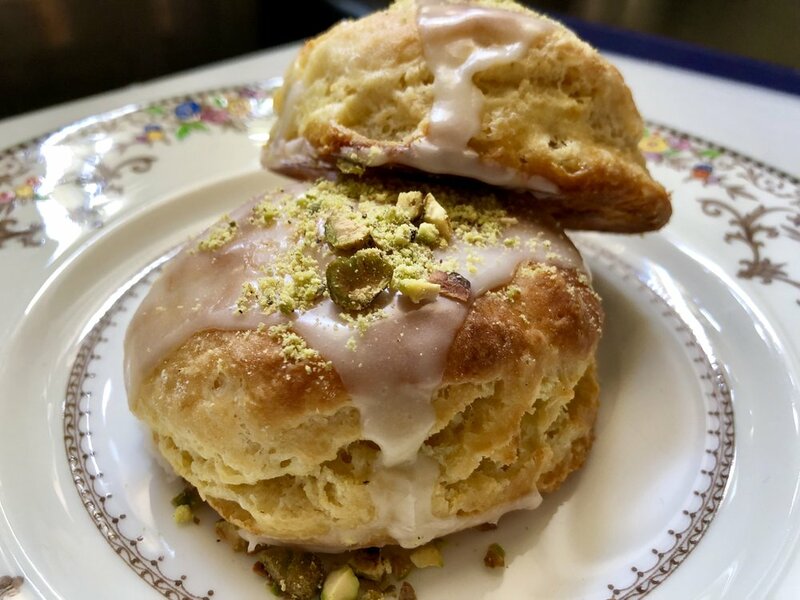 The three magical ingredients for this venture were Orange, Pistachios, and Buttermilk. 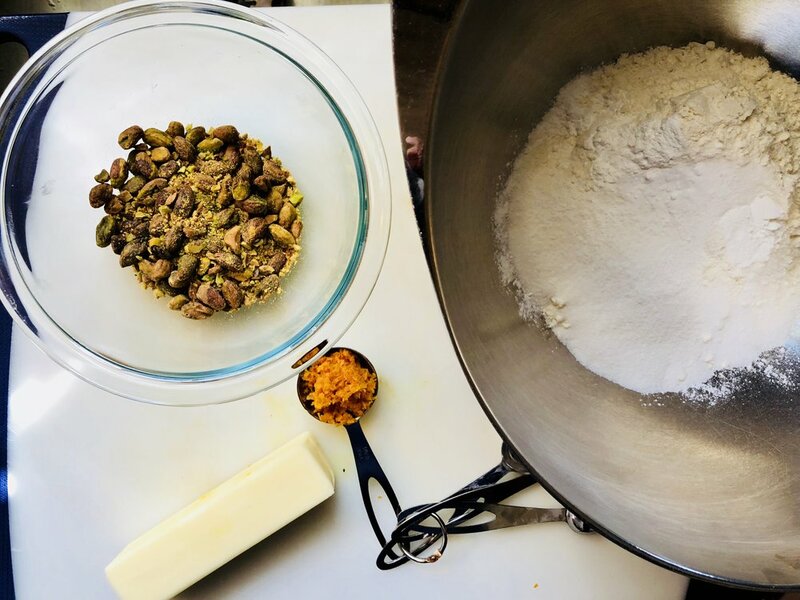 The rest of the recipe is just my basic scone ingredients and a lot of finger crossing. Introducing Emily to my new favorite "watering hole", Ponyboy... or as I like to call it "The Sunday Scone Enabler". I hope you enjoy this version… and please, go out and have a great night with friends! Coffee helps... and Jazz in the background. What I had on hand, mad e a delicious morning treat... with lots of coffee. Brush the tops with Buttermilk or heavy cream! Preheat your oven to 400 degrees and prepare a baking sheet with baking spray or Silpat liner. In a large mixing bowl combine the flour, salt, sugar, baking soda, and powder. Stir around to combine. In a liquid measuring cup pour in the buttermilk to measure out one-half cup. Add the whole egg, vanilla, almond extract, and the fresh orange zest. Mix until the egg is beaten and all the ingredients are combined. Set aside. To the dry mixture add in the cubed butter. With a pastry cutter, a fork or your hands, cut/rub in the butter with the dry mixture. The butter should be cut in enough to resemble a coarse meal texture. Pour in the buttermilk mixture and with a spoon gently mix in until you have a nice wet dough. Turn the dough out onto a lightly floured surface and knead lightly. Turning the dough over until it is slightly firm and less sticky. Roll the dough out to half or three-quarter inch thickness. 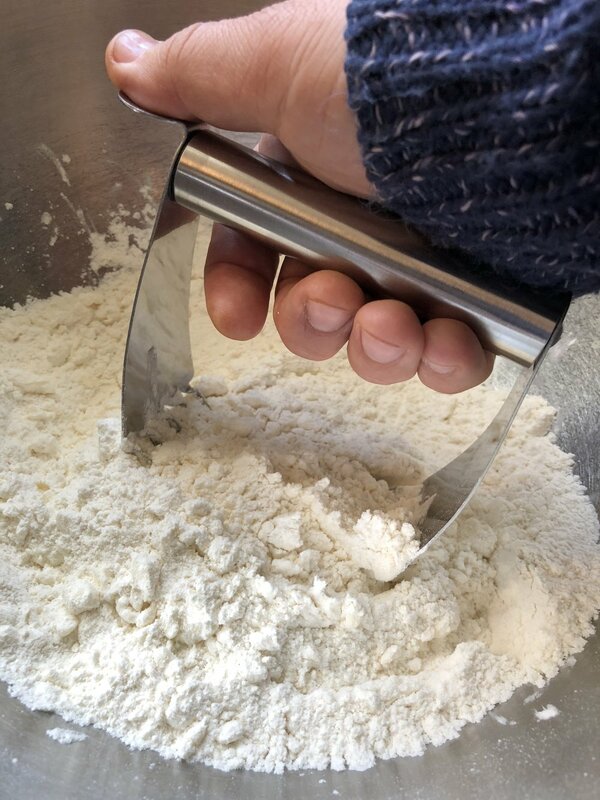 Using a 2” cutter, dip the cutter into flour and cut the scones out as you would cutting biscuits. Place the scones on your prepared baking sheet. 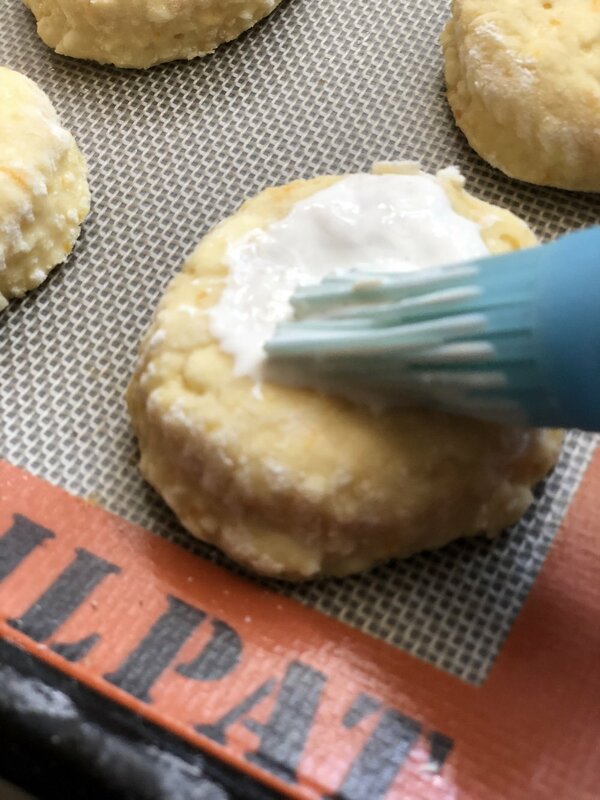 For extra richness and color, brush the tops of the scones with buttermilk or heavy cream. Place the scones in the oven and bake 15 minutes or until golden brown. Remove the scones from the oven and allow to cool before glazing. For The Glaze: In a mixing bowl add the powdered sugar. To that add the t tablespoons of fresh orange juice, vanilla and almond extract. Mix vigorously until smooth and flowing. Add one teaspoon of glaze to the tops of each cooled scone and allow it to drizzle over the sides. Sprinkle the tops with the chopped or ground pistachio. Serve the scones on a platter, plate, or pastry tier, and enjoy!